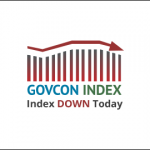 The GovCon Index registered a decline of 2.234 percent — or 1.784 points — to 78.070 Monday as U.S. markets returned to full activity and new federal technology services contractor CSRA (NYSE: CSRA) started regular-way trading on the New York Stock Exchange. Falls Church, Virginia-based CSRA opened at $29.39 and ended Monday as the Index’s largest percentage gainer at a rate of 7.87 percent to $31.51. CSRA replaced its former parent company Computer Sciences Corp. (NYSE: CSC) in the Index and that change contributed 1.237 points to the Index’s overall decline Monday. The other 0.547 points of the Index’s loss was due to market conditions that saw U.S. stocks trade slightly lower on November’s last day. CSRA CEO Larry Prior, CSRA Chairman and CSC CEO Mike Lawrie and other executives from both companies rang the opening bell at the NYSE to start Monday’s trading day (scroll below the tables to watch Prior, Lawrie and other CSRA executives ring the bell). CNBC reports U.S. investors have their attention on retail sales figures for the Christmas shopping season, Federal Reserve Chair Janet Yellen’s remarks to the Economic Club of Washington on Wednesday and the congressional Joint Economic Committee on Thursday, as well as the European Central Bank’s Thursday meeting for a decision on interest rates there.